Sea Power: The History and Geopolitics of the World’s Oceans, by the US Retired Admiral James Stavridis, has been published recently to critical acclaim and his author has been hailed as a new Alfred T. Mahan for the XXI century. Mahan was the first modern strategist to theorize on the influence of sea power upon history in his homonymous book, published in 1890 but still influential in geopolitical circles. In a nutshell, Mahan tried to demonstrate that the rise of the British Empire was made possible due to the prevalence of the British Navy. A vigorous proponent of an active foreign policy for the United States, Mahan contended that if his country was to succeed as a major power, restlessly expanding its reach into foreign lands and markets, it had to replicate Britain´s strategy by means of building up a powerful US Navy. Needless to say, at the end of the XIX century the same rational was soon adopted by other would- be great powers like Germany, thus paving the way to a naval race that went amok and ended up creating the conditions that led to World War I.
Stavridis is less ambitious in his aims than his illustrious predecessor, at least openly. But his book can not be read without getting the feeling that it was written to impress upon an increasingly inward-looking US leadership the need to retain the command of the seas before others, particularly an assertive China, will fill the void. A former NATO Supreme Allied Commander Europe from 2009 to 2013 and currently dean of the Fletcher School of Law and Diplomacy, Stavridis tries hard to infuse the reader with a sense of the relevance of oceans and sea-lanes throughout history. But as in Orwell´s Animal Farm, it always happens that there are some masses and courses of water that are more important than others. For Stavridis, the mother of all oceans is the Pacific, but the three current hotspots when it comes to the possibility of a maritime conflagration are more specifically located in the Eastern Mediterranean, where Russia keeps a naval base in Tartus (Syria), the melting Artic, and the South China Sea, a major shipping route where China and other countries are trying to assert their sovereignty while the US and some of its allies are trying to uphold the principle of freedom of navigation. Though conscious of the importance of dealing with each body of water separately and according to its own merits, Stavridis never forgets an old adage he was taught when he was still a midshipman: that the sea is one. This truism, since in fact all the oceans are physically interconnected, is nevertheless a relatively recent geopolitical novelty. And it is not something that was discovered or made possible by the mastery and command of the British Navy in the XIX century, as it is usually narrated, but centuries before due to the navigating skills and courage of two Iberian sailors and the enterprising spirit and vision of Emperor Charles V and his advisors. 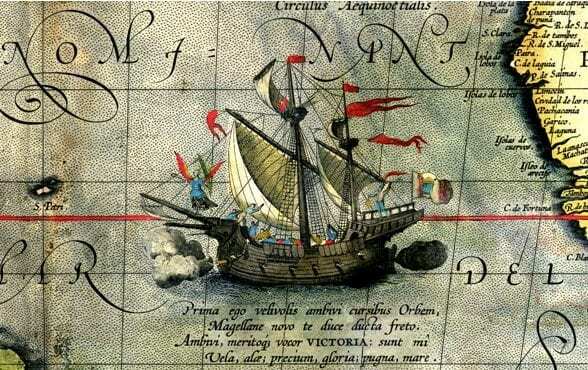 An expedition led by Magellan set sail from Spain on 20 September 1519 and made the first circumnavigation of the world when the last remaining ship of the expedition, the nao Victoria, arrived in Seville on 6 September 1522. Magellan himself was killed in an ambush while sojourning on a Philippine island. As to the rest of the mission’s 260 original crewmen, only 18 led by the Basque navigator Juan Sebastian Elcano survived the three-year journey. Following on their footstep, Charles V’s successor Phillip II was to create the first two large transatlantic and transpacific permanent fleets on which, centuries later, even the US Navy modeled its own maritime strategy. In fact, as Admiral Stavridis acknowledges in his book, Spain built the first permanent pan-Oceanic economic and naval system ever devised, a feat that lasted for more than two centuries and a half. Thanks to the first circumnavigation of the world by Magellan-Elcano and its enduring legacy, the sea, and the world as we know it, became really one. Two years from now, almost day by day, we will have the occasion to commemorate the 500 anniversary of that remarkable feat that changed history forever.